Our very own Michael Avagliano reminded me of something that many people have told me: "The violin does have antique value -- in fact that's all that it has. The sound of an instrument, no matter how amazing, cannot factor into the price because it's subjective in nature (you love it, but someone else might not)." Another person I talked with was one Violinist.com's pioneer members, Emil Chudnovsky, who was kind enough to talk to me even though he was at a restaurant with his fiance. "So what's the make of this violin?" he asked, "Ah, my mom had a Gagliano. She loved it." I said that a number of people had advised that I could find the same sound in a modern instrument. He mentioned that he has played on a number of very fine-sounding modern instruments, in fact, most recently on an excellent modern violin by Howard Needham. "When it's at its best, it has the timbre of an old Italian instrument and the resonance of an amplified modern fiddle," he said. "I've seen some of Zygmuntowicz violins that put to shame anything anyone says about modern instruments, many of them are everything you might want to hear in an old or modern fiddle." We talked about the fine modern instruments that are out there, and also the older one in my hands. "There are many dealers that would say if it's not pristine, it's a bad investment, but if it's a good players' instrument you should seriously consider it. 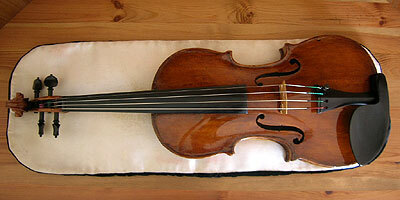 It's difficult to find a violin you are truly in love with." "I think I have one I truly love, right here," I said. "Well, just make sure they let you play on it for at least two weeks," Emil advised. "I've been playing on it two months," I said. "TWO MONTHS? And you're still in love with it?" Emil said. "Buy it!" I could have gave you the same advice. Okay, maybe not... But the BUY IT part at least. It's time. Sell Robert and buy the violin. Hock your first borne and buy it. Laurie, if you buy it, can we all come and have a play of it so we know what something good sounds like? Spill the beans sister. How many samolians for this banjo? The vote is unanimous, Laurie. Buy it. Then we'll all visit you to hear it. Now now guys. Robert and both of my kids are priceless! I'm one of the most frugal people in the world, Laurie, but true love is true love. Go for it! Mine's not that much! It is under 100K because of the skater devaluations. It's a real nowhere land, when it comes to price. The really fine old ones tend to be more than 100K. But for under that, an old Italian instrument would have some compromise. And yet, it's still so much money, one wants to feel that it is a sound investment when looking at the violin as an object. What a conundrum! Buy it, buy it, buy it! Pay in installments if you have to!! This is true love!!! Okay, then don't sell your first born and husband to get the violin. Rent them! C'mon Laurie! It'll do you good! Buy it! Laurie, have you tried any other violins in that price range or is this the only one? Good luck with the decision making, Laurie! If you get the instrument you could do a concert and have admission go towards the purchase of the instrument! I bet any v.com members in the area would love to come and hear you! Laurie, I hope you get the violin. Perhaps if we all sent Laurie a contribution in appreciation of how much violinist.com enriches our lives, she would have an easier time deciding. Robert, can you set up an online donation system, or should I express my gratitude by snail mail? Oh you guys don't need to do that. But you can tell your friends about v.com, since more readers generate more good karma for everyone on the site. Really, my conversations, e-mails and comments from v.com members have given me a great deal of perspective. I'm just as grateful for this community as everyone else! Laurie, can you make a short two minute recording with this violin and post it so we can hear how wonderful you make this instrument sound?